Yep…that’s what it was. The WOD looked relatively tame, but it wasn’t. The front squats were rough the first round. My back started getting tired and it was hard to keep correct form. The last round was torture. The box jumps sucked, as usual! Since my breathing is getting bad again it’s even harder to push through. My body isn’t getting enough oxygen to push as hard as I was pushing before. I’m trying to cut out all nightshades to see if that will help minimize the inflammation in my throat. I hope it works! I finished the day up with 30 GHD Sit Ups. These were tough too since I made sure I went all the way back so I could touch the floor with my hand then all the way back up. 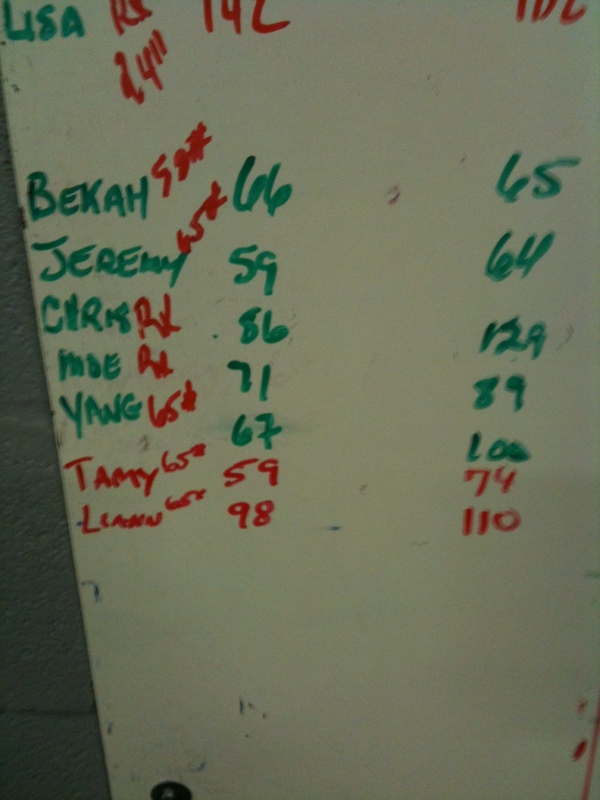 This entry was posted in Workout and tagged Box Jumps, Crossfit, Front Squats, GHD Sit Ups on April 25, 2011 by Tammy. Tuesday brought an interesting day, as far as the workouts go. Alaina told Michelle and I that our workout today was going to incorporate a lot of running, but thankfully that is tomorrow’s workout and not today’s! We started practicing Clean Squats for our skill. We just used a 45# bar so it wasn’t for max weight. I kept hitting my collarbone. The problem must be my inability to get my elbows up high enough or fast enough to rest the bar on. That is definitely a weakness I need to work on. The WOD was a little different in that it was all strength. We focused on the Front Squats with increasing weight. Each time we went down a round in reps we were supposed to go up with weight. Each round’s reps were repeated twice. Weight as follows: 2 rds of 8 (45#), 2 rds of 6 (55#), 2 rds of 4 (1 @ 65#, 1 @ 85#), 2 rds of 2 (95#), 2 rds of 1 (105#). Michelle maxed at 125#. Awesome. I had a tough time getting back up with the 105# so I called it good there. I regret that now. I think I may have been able to go up one more, and Michelle was trying to encourage me to try the weight but I talked myself out of it. Next time I’ll go until I have to dump the weight. I really enjoyed the workout. I was able to push the weight instead of just doing numerous reps. Some of the guys were doing up to 300#…crazy! Since Shane didn’t feel like we got our money’s worth, he had us finished the day off with 35 Goblet Squats (25#), then 8 rounds of 10 GHB Sit Ups and 10 Knees to Elbows. I definitely think I got my money’s worth! As I type this I can already feel spots that are going to be sore starting tomorrow! This entry was posted in Workout and tagged Crossfit, Crossfit Firsts, Front Squats, GHD Sit Ups, Goblet Squats, Knees to Elbows on April 5, 2011 by Tammy.